Have you got what it takes to be triumphant in our first ever Pavilion Bar Quiz ? Night? 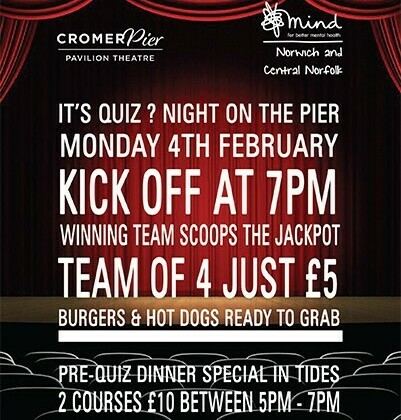 We have been busy bees swotting up on our general knowledge to prepare for the very first Cromer Pier Quiz ? on Monday 4th February, have you got what it takes to be triumphant, scoop that jackpot and get your team name first on the trophy. Book a team of four for just £5 online in advance or if you prefer to be a bit more spontaneous you can just turn up on the night. So, get googling and grab a group of friends, colleagues or family and come and join in, it’s going to be a blast. ps… don’t forget to bring plenty of cash for the raffle..